Tohoku HELP has its secretariat in Sendai. The accident of Nuclear Power plant took place at the coast of Fukushima Prefecture. Since then, Fukushima coast and Sendai has a special relation. and South, which lies between Fukushima City and the Pacific Coastal Area, became an extremely dangerous area contaminated by radioactive materials, which resulted Pacific Coastal area to become a “far existence” from Fukushima City. The people of FCC prayed, and this condition was conveyed to Tohoku HELP. care for the people in Souma and Minami Souma, which lies at the north of the explosion site, giving aid from Sendai is greatly meaningful. Our conclusion came to this as we received request for aid. So this spring, we went to Souma and Minaimi Souma taking with us the funds, which had been entrusted to us, in order to search for a possibility of aids we could offer them. Whereupon we got the information that Rev. Ichiko Gotoh of Japan Alliance Christ Church had retired his pastoral position, in order to devote himself to aid the people afflicted by disaster in Souma and Minami Souma. This Rev. Gotoh had been a person who explained the situation of Fukushima to us very precisely when we Tohoku HELP entered Fukushima in June of 2011. Tohoku HELP discussed the matter with FCC immediately, and decided to receive him as the person in charge of Souma to support his work. Since then Rev. Gotoh periodically gives us report, and this report has now become a valuable data as a stationary measurement of Souma and Minami Souma area. People who have lost their homes by tsunamis, and those who had to leave their homes because of the Nuclear Power Plant Accident are forced to live in the same temporary residence in Souma and Minami Souma area. There used to be a wide gap between those two groups at first, but now these gaps are being filled up. Now the people living in the temporary housing, each feels the others pain, and give sympathy to their situation. Rev. Gotoh’s efforts are working as a catalyst in changing people this way, and rejoicing to be able to take part with him, I now report the work, which had been done until now in Souma and Minami Souma. We have received this report in September, and I would like to convey it below by changing its layout. I wish that this would become a help for all of you to understand the “present situation of Fukushima”, and I also wish that this would be an opportunity for all of you to come together in prayer. Few project such as baking cookies and making potpourri were taken up as the relief work from now on. These activities were new ideas for Sarachi Area, and would be discussed later. 28th(Friday) Rev. Chu Kosaka’s concert was planned, and discussion is necessary which temporary housing we will use for a concert hall. 7th(Friday) We met the Ward master of Kitaiibuchi Temporary West Meeting Hall, but the feelings against Christianity remains in him. 13th(Thursday) 180 invitation pamphlets were distributed with the help of Sister Kanbara from CRASH. Later on, we had time for fellowship and prayer. 14th(Friday) 1P.M. Potpourri was made at “Flower Café” in Kitaiibuchi Temporary Housing East Meeting Hall. were 16 in number (one boy), CRASH : Sasaki, Kanbara, Keisein Church : Rev.Ookita, Ushiku Keisen Church : 5 in number, Rev. Kasai, Mr. Gotoh, total of 26. Potpourri(Lavender and Rose), which was just wrapped in a cloth cut in a circle, was tied with a ribbon together with a few artificial flowers. It gave out a pleasurable scent, and the artificial flowers that were chosen were acceptable as an ornament. The participants opened their hearts and took time to have conversation at teatime fellowship. Later on, they were divided into two teams for a physical exercise with a towel, and everyone were emotionally buoyant for a game called Jencar. As being on the side taking cares, we understood the preciousness of having a nice conversation. 19th(Wednesday) Visited the Onodai Temporary Housing in the morning. 26th(Wednesday) Distributed the invitation to Onodai Temporary Housing 1 (120 pamphlets), and Temporary Housing 6 (170 pamphlets). Participants: 11 in number + 2, CRASH : Mr Sasaki, Chu Kosaka, From Okinawa 2, From Nagasaki 1, From Yokohama 3, From Gifu 2, From Souma Church 3, Mr. Gotoh, total of 27. Rev. Kosaka started singing with his original song, and those that came through a light rain (Haragama Area) joined their voices with other participants conversation. And there talk was like that of men from the sea. They had lost their homes in a tsunami, and grieving because there was no place for them to go, opened their hearts by singing. There were some that shed their tears as they listened to the song, and we joined in tears. They even opened their hearts to Mr. Kosaka at teatime, and enjoined conversation with him. 34 in number + 3 staffs, CRASH : Mr. Sasaki, Chu Kosaka + 8, Mr. and Mrs.
Kasai, 2 church members, Mr, Gotoh, total of 52. It started like the one held from noon. The participants this time sat and waited for the starting. These were the peoples, who took refuge from radiation (Iidate Area). The atmosphere were different, nevertheless they all had mirthful time. They opened their hearts to Rev. Kosaka’s talk. One guy in his 50’s jeered, but he was a bit drunk, and his heart was filled with pain. He said that though he had a house, he never knew when he will be able to return, and also said that he did not have any dreams nor hope. And since he worked as a farmer, he did not know how to do other work. Since dinner time was near, they could not relax to have a long conversation with Rev. Kosaka, but they asked him many times to come back again. The people here hardly have a chance to go out to town, so they were craving for conversation. Tohoku HELP started dealing with Radiation Issues from June 2011. Radiation issue had been a very delicate issue even before the earthquake. But the issue became an unavoidable problem after the Nuclear Power Plant had an explosion accident. Hearts of many people are being riven, and daily live their lives burdened with distress and pain. A year and a half passed since we started thinking how we should face these issues. And this summer, Tohoku HELP representative Reverend Takashi Yoshida wrote an article and officially announced it. This article was sent and published on the newsletter “Peace of Article 9 for those having religion”. 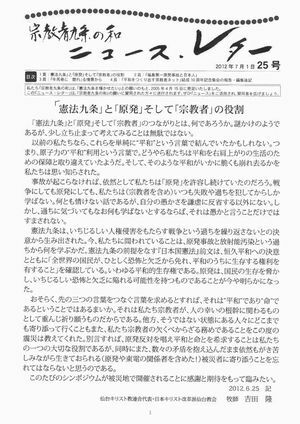 “Sendai Christian Alliance”, which is the largest group supporting Tohoku HELP, made decision on participating in the special event “Eighth Symposium and Peace Pilgrimage in Sendai” which “Peace of Article 9 for those having religion” sponsors, and because of this relation, the article was sent to them. For this special event, please access from here. The fundamental posture of Tohoku HELP concerning radiation issues are clearly written in this article written by representative Yoshida. Following are the contents. We would be pleased if you would go through this article. And will be glad to know that this would be a help to know our posture. We the “Peace of Article 9 for those having religion” started on May 15th, 2005, with the wish to have “Article 9 of the Constitution” shine. This “News Letter” is sent to those who approve the wish of “Peace of Article 9 for those having religion”. Please make practical use of this news letter, and let us spread these to those who wish the same. What is the connection of “Article 9 of the Constitution”, “Nuclear” and “Those who have religion”? Though this question is like a riddle, I think it is not pointless to use sometime to think about this matter. Before the earthquake we just joined all these things simply by using a word “Peaceful”. In short, we used the word “nuclear power for peace”. Somehow we’ve been misunderstanding “Peace” with the warranty for the continuous growing needs of living. And we were made aware that this kind of peace is susceptible to collapsing. If the accident had not had happened, we would have kept permitting the existence of “Nuclear Power”. Concerning war or Nuclear Power, we (including those who have religion) always do not learn till we fail or commit a grand error. It is a sorry history, but we do not have any alternatives but to just admit and repent of our foolishness with a humble heart. And if we do not try to learn from it even after we realize our error, we would be more than fools. Article 9 of the Constitution was set forth so as not to repeat the transgression of war, which brings about the clearly distinguishing violation of human rights. What is now called in question is what we would learn from the errors of nuclear accident and contamination by the radiation. The hypothesis of Article 9 of the Constitution, which is “The Japanese Constitution” starts with the determination of lasting peace and also confirming to “Keep the rights of living for the people in the whole world, so that they may all live without fear and poverty”, the so called “Rights to live in peace”. Nuclear Power threatened the life of the citizens, and now it is clear that this nuclear has the power to throw us into fear and scarcity. If we think about the words to connect the formerly said three words, it could be “Peace” and “Life”. We think this way, because we who have a religion pray and wish knowing and valuing that these things relate to the fundamental happiness of humans. This disastrous earthquake also taught us that we who have a religion have an essential duty of keeping close to those who do not have the same wish as ours. In other words, our important roles is to greatly desire the peace and life by opposing against nuclear power, but in the same time, we think that we should not forget to keep close to the hearts of people in Tohoku who have experienced affliction by disaster (including all interest parties of Tohoku Electricity and Nuclear Power Plant), who are still striving amidst numerous contradiction. We would like to attend this symposium that would be held at the disaster affected area, with hearts of gratitude and with many expectations.